Winter is a good time to think about adding new features to your garden spaces. 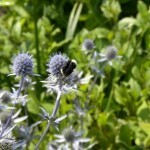 Consider bringing new life into the garden, in the form of chickens or bees. Both will help you have a more productive garden as they eat the bad bugs, manufacture soil enriching compost for your soil and pollinate your fruiting plants over the summer.